Once, when I was thinking about a problem in my developer project, I needed to initialize a list with some groups. GroupList would not work because there wouldn't be enough independence and I wanted separation of responsibility in the final result. Obviously, we need to do this with tough binding - x:Bind. If we want to create one List inside another List, we need to use two types of models. Simple. Students will be inner List. GroupStudents outer List, which contains instances of inner List (Student). Just a name. Nothing else. HeaderListView as you can see it will be a Header for each ListView. StudentItems list with type of our first model. We have to make two Lists here. GroupStudent ObservebleCollection with type GroupStudent, which will contain inside Header and instance of Inner List (_students). Instance of our inner list. 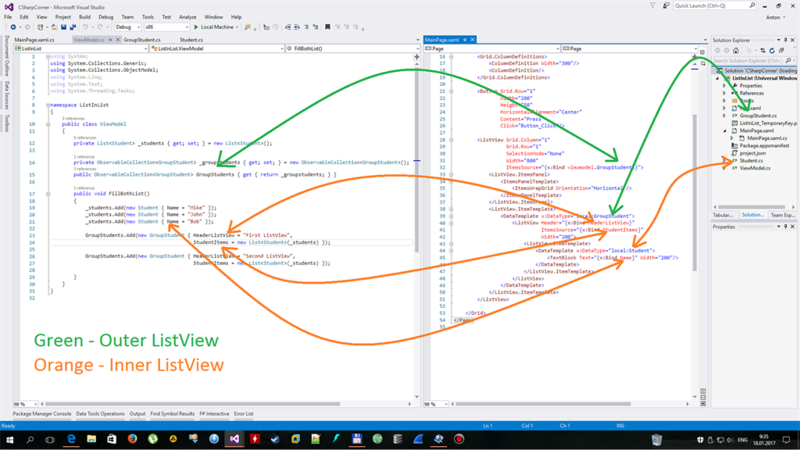 In MainPage.xaml.cs we are creating viewmodel and calling method - FillBothList from eventhandler. XAML code is an important part of all these steps. Understanding this is key to recognize binding. Create the Button for starting process. Outer ListView with ItemSoucre of GroupStudents. ItemsWrapGrid - for horizontal initialize. Or you can use GridView. Inner ListView with Header property and ItemSource StudentItems, which was included like the property of GroupStudent list. TextBlock with one field Name which was included inside Student type.